ST. GEORGE – Nearly 1 million people participated in a statewide earthquake drill Thursday morning as a part of the Great Utah ShakeOut. Among them were students, faculty and staff at Dixie State University as the event gave officials the opportunity to test the school’s campus-wide emergency alert system. At 10:15 a.m., over 980,000 Utahns dropped and sought cover under some kind of shelter like a desk or table, covered their heads and held onto a part of that shelter for about a minute until the period of the simulated shaking passed. This safety practice is called Drop, Cover, and Hold On! For many, that was the end of the statewide drill. However, many institutions, from hospitals to schools, followed up with their own drills and emergency response scenarios. 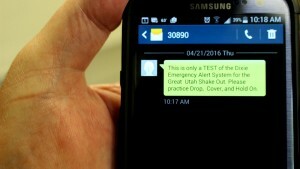 In St. George, emergency management officials at Dixie State University used the day of Great Utah ShakeOut as a test of the school’s emergency alert system. Dixie State’s Community Emergency Response Team was also mobilized in order to train with a new piece of evacuation equipment. The emergency alert system, which can be accessed by a few select individuals, is set up to send emergency alerts to students, staff and faculty over various mediums. “It will call people’s (phone) numbers if they have registered their numbers – their cell numbers and office numbers,” Dennis Cox, Dixie State’s health and safety officer, said. Phones will be called by the system with the alert repeatedly until someone responds to it. Texts to mobile phones are also sent out. As well, computer and television screens across campus are overridden to display the alert, whether it be a regular test, or the real deal. “It’s quick, it’s accurate, and it gets out,” said Josh Thayn, Dixie State’s director of risk assessment. The alert system is internet-based and can also be accessed through a mobile app on a smart phone, he said. The alert system can be tailored to send out notices on any kind of emergency, from the simulated earthquake to an active shooter situation. The emergency alert system is tested at least twice a year, Thayn said. The system can also be used to alert Dixie State’s CERT team if they’re needed. “What we’re proud of here is that we have a Community Action Response Team – a full team made of faculty and staff that are ready on any given day.” Thayn said, adding the university has a fully stocked CERT trailer on campus as well. 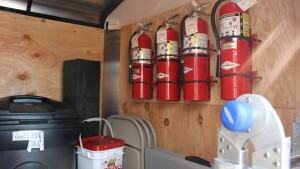 Filled with equipment to aid in fire suppression, search and rescue, emergency medical items and disaster relief, the trailer can go hooked to a car or golf cart and taken anywhere it’s needed on campus. “You’ll be hard pressed to find other colleges or universities that have a stocked trailer and on-site CERT team,” Thayn said. Following the use of the alert system, members of Dixie State’s CERT team met on the top floor of the Jeffery R. Holland Centennial Commons Building. 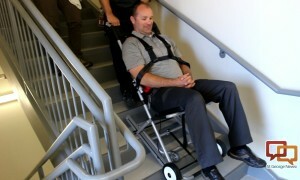 They were gathered to practice using a new evacuation chair that can be used by a single individual, if necessary, to get another person down a flight of stairs. Hung on the wall near the stairs, the evacuation chair folds out and allows a person to sit down and be strapped in for transport down the stairs. In order to aid in a smooth run down the stairs and safely out of the building, the back of the evacuation chair is outfitted with a rolling track. The practice drills are “extremely helpful,” Cox said, as they prepare the CERT team members how to react in various situations. It helps them know their capabilities and limitations, he said. CERT team member Linda Jones, an education librarian at Dixie State, said it was good to have hands-on training versus simply talking about what to do. Jones, who is from southern California where quakes are commonplace, said it was good Utah was participating in the ShakeOut. “To have this exercise is good for people to realize (an earthquake) could really happen here in Utah,” Jones said. Earlier this week, researchers told media outlets there is a 43 percent chance of a magnitude 6.75 or greater earthquake hitting the Wasatch Front within the next 50 years, Fox 13 News reported. One quake scenario on the Great Utah ShakeOut website has the Salt Lake City segment of the Wasatch fault triggering a 7.0-scale earthquake. Estimated fallout from such a quake is estimated at over $35 billion in damages, displacement of 97,700 households and the deaths of between 3,500 and 4,400 people.